Q: I have a Utilities Kingston account, but it is only for electricity, can I still purchase a rain barrel? Yes. You can purchase one or more rain barrels, as long as you receive a Utilities Kingston bill for any one or more of our services, and your account is in good standing. Q: Can I order a rain barrel for a friend or family member, even though their billing account is not in my name? You must be a Utilities Kingston account holder (in good standing) to order a rain barrel. Q: Can I order more than one rain barrel? Yes. You can order more than one rain barrel (up to a maximum of four per billing account, per year). Q: Can I purchase a rain barrel if I do not have a Utilities Kingston account? This program is only available to Utilities Kingston account holders (in good standing). Rain barrels are available at numerous retail outlets separate from this program. Q: Does Utilities Kingston profit from the rain barrel program? The $50 covers the costs associated with the rain barrel to Utilities Kingston. We do not profit from the program, as we provide it to promote water conservation and sustainable gardening practices. If we were to offer the rain barrels at a reduced rate, then we would be asking the utility rate payer to subsidize the program. Q: I own more than one home, can I have a rain barrel for each address? Yes. You can order up to four rain barrels per Utilities Kingston account. Q: I own more than one home, I’d like to order a rain barrel for each address - however, I want them both delivered to one address. Is this possible? What if I’d like the barrel placed on my porch instead of the curbside? Please indicate special delivery requirements at the time of ordering your rain barrel. Q: How big are the rain barrels? Rain barrels are three feet high and two feet in diameter. They hold 210 litres of water. Q: What colour is the rain barrel? What is it made of? Rain barrels are available in beige. Barrels are made of durable, UV-resistant plastic that contains post-consumer recycled materials. Q: I bought a rain barrel last year, can I purchase another this year? Yes. You can purchase up to a maximum of four rain barrels per billing account, per year. Q. Can I exchange the rain barrel I purchased last year for one this year? No. However, Utilities Kingston offers a one-year warranty. For warranty inquiries, please call customer service at 613-546-0000 from Monday to Friday, from 8 a.m. to 5 p.m.
Q: Is the rain barrel screened and child proof? Yes. The top is made of a built-in child- and pest-proof plastic lid and screen. Q: Can I leave a rain barrel outside during winter? We recommend winterizing your rain barrel by draining it and turning it upside down, so water does not accumulate and freeze. Q. Where can I find out how to install and winterize a rain barrel properly? 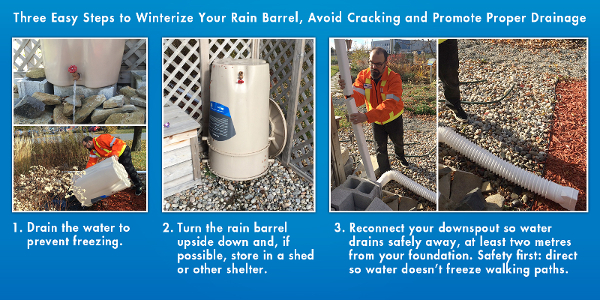 There are three easy steps to winterize your rain barrel. Drain the water to prevent freezing. Turn the rain barrel upside down and, if possible, store in a shed or other shelter. Reconnect your downspout so water drains safety away from your foundation. Q: When will my rain barrel be delivered? Deliveries will start mid-May and continue until barrels are all delivered. Generally, your rain barrel will be delivered three weeks after the time you order it. Q. I don’t want my brand new rain barrel and would like to return it. Visit our reception area located at 85 Lappan’s Lane, fill out a form, and we will direct you to the warehouse. Utilities Kingston will not pick up unwanted rain barrels. Spare parts are available for pickup from Utilities Kingston during regular working hours 7:30 a.m. – 4:30 p.m. at 85 Lappan’s Lane – Utilities Kingston’s service entrance. Q. Is there a warranty for my new rain barrel? Utilities Kingston offers a one-year warranty. Rain barrels that were not winterized and then cracked at the bottom are not covered. For warranty inquiries, please call customer service at 613-546-0000, Monday to Friday, from 8 a.m. to 5 p.m.
Q. I would like to dispose of an old rain barrel. Rain barrels can be returned to our warehouse for re-cycling. Visit our reception area located at 85 Lappan’s Lane, fill out a quick form, and we will direct you to the warehouse for re-cycling. The Kingston Area Recycling Centre will NOT take rain barrels and rain barrels will not be picked up as trash or curbside recycling.